Even though Chicago is famous for deep-dish pizza, there’s no shortage of luxury restaurants within this bustling city. As of 2017, 26 high-end restaurants throughout Chicago boasted at least one Michelin star. As more clients continue to crave exquisite dishes, the number of superb dining options in Chicago is growing exponentially. Last year alone, four restaurants in Chicago received Michelin stars. This impressive growth showcases how quickly Chicago’s restaurant scene is evolving. Boasting a robust selection of local ingredients and a wildly diverse population, this booming metropolis is set to become a luxury foodies’ paradise. Emboldened by other venues’ success, more restaurants are upping the ante to reach new levels of prestige. In this city, it takes a lot to stand out. There are over 8,190 restaurants in Chicago, and this fierce competition has created some truly outstanding venues. From utilizing world-renown chefs to offering exclusive multi-course meals, there’s no end to the novelties featured in Chicago restaurants. Faced with a never-ending amount of options, finding the best restaurants in Chicago is a surprisingly daunting task. While it’s easy to find good food in Chicago, discovering the finest restaurants can be surprisingly complex. To guide our readers to Chicago’s finest venues, we compiled a list of the best restaurants in Chicago. This city is filled with top notch options, so prepare to get an intimate look at Chicago’s luxurious palate! Nestled on the 40th floor of the Chicago Stock Exchange, this restaurant is the epitome of luxury. When browsing their menu, it’s no secret that this restaurant is owned by a world-renowned chef. From foie gras and poached halibut to whipped cauliflower dotted with caviar, proprietor Jean Joho showcases everything novel about French cuisine. All of their impressive offerings revolve around seasonal fare and local specialties, which proves to be a winning combination. Their creations have been featured on Food Network’s “Best Thing I Ever Ate”, so it doesn’t get more memorable than Everest. When it comes to Midwestern cuisine, this revered restaurant steals the show. Chef Kevin Hickey showcases the versatility of Chicago’s local markets with an undeniably unique menu. This diverse selection of main courses incorporates everything from seafood to game, and is complimented by equally enticing vegetarian options. Their five-course tasting menu provides a delicious overview of everything the restaurant has to offer. For those who want a truly unique experience, they can reserve a place at the Chef’s Table. This exclusive option allows six people to dine in the heart of the kitchen, which provides front row seats to the preparation process. On top of receiving a Michelin star, Allium has also received the Forbes Four-Star & AAA Five Diamond awards. These coveted awards are a testament to the outrageously high standards that this restaurant routinely exceeds. Even the fanciest restaurants in the world can’t compare with having exclusive access to a private chef on a yacht. 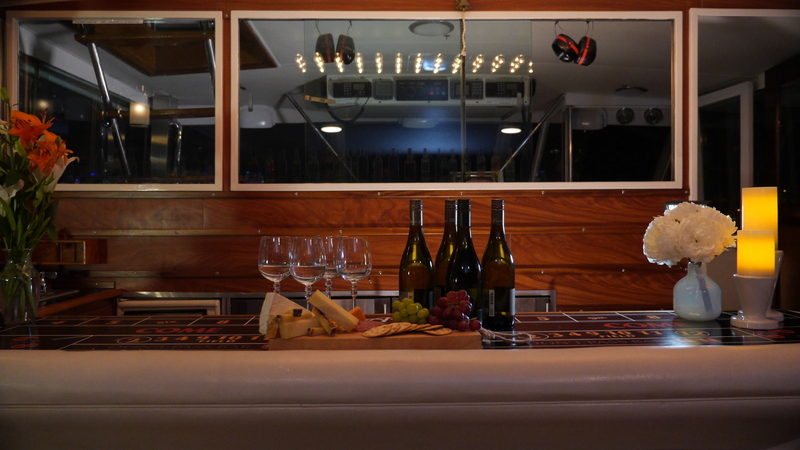 The private chefs onboard Adeline’s Sea Moose boast a massive selection of 4-course, 5-course, and 6-course meals that are complimented by the client’s choice of high-end wine & champagne. From sushi to truffle pasta, no dish is too exotic for our chefs to prepare. They can cook anything the client requests, which puts the customer in charge of what they indulge in. This versatile approach to dining can’t be beaten, since it allows anyone to experience what it’s like to be treated like royalty. Our chefs are ready to pamper your taste buds, so don’t miss out on this unique opportunity! Aside from providing a level of freedom that’s impossible to experience in a land-based restaurant, we offer an unmatched setting. 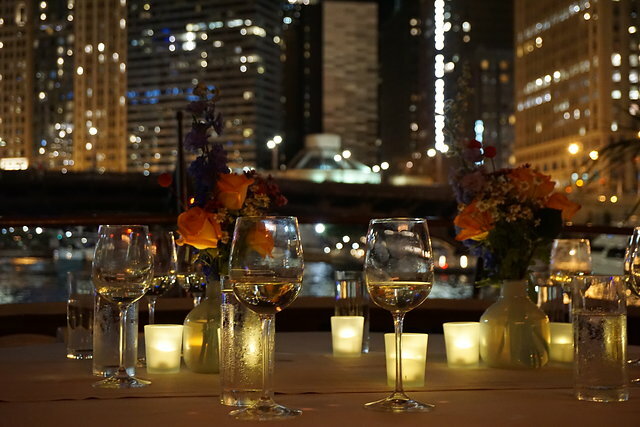 From gorgeous on deck sunshine to breathtaking views of Chicago’s nighttime skyline, our clients enjoy the best of both worlds. 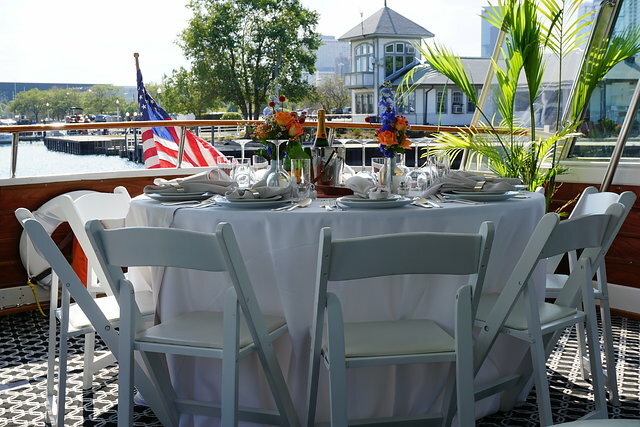 All catering and private meals are served on top of white linen, which creates a breathtaking presentation. Our yacht is 68ft. long with 4 levels, which allows us to host everything from the most intimate reunions to bustling company events. 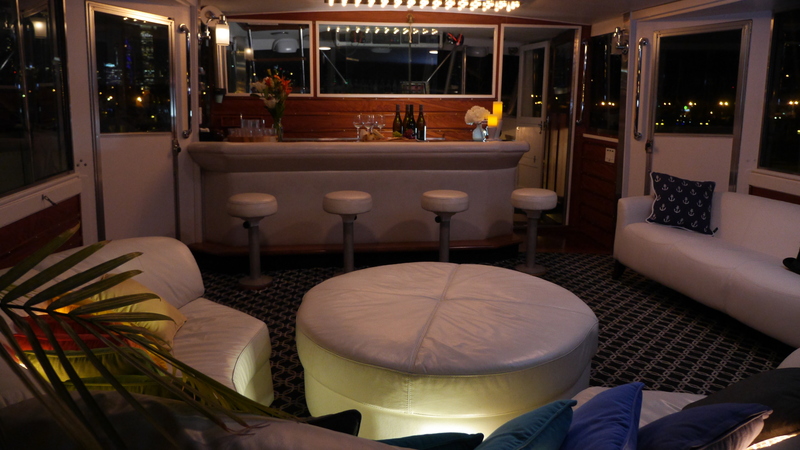 All this is complimented by a full top-shelf premium bar and lounge, sleeping accommodations & a professional crew. Adeline’s Sea Moose is the only yacht this size that explores the Chicago River, so come embark on the luxurious adventure of a lifetime!